I've been avoiding writing out this inquiry but having been playing around with it for a few weeks. That's because I've always harbored a bit of disdain for gurus as a whole and realized that the reason for the judgment, as in most stereotyping, was due to laziness. My preconceived notions needed to be torn down in order to take a good look. So I took a sledgehammer to them. Though I haven't had any experience with gurus outside of YouTube videos, I've got a mental image that teachers like Mooji or Gangaji, (or any ji) can easily fill. 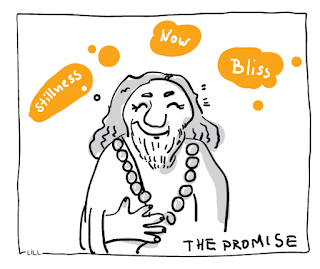 Anyone with robes or long and flowing clothing, beads, a slow blink, and a bouquet of flowers nearby or hung round the neck qualify as the stereotypical guru. There are those who skirt the edges. Adya and Rupert Spira come to mind, but with those guys, I think it's really just the flowers that throw me. 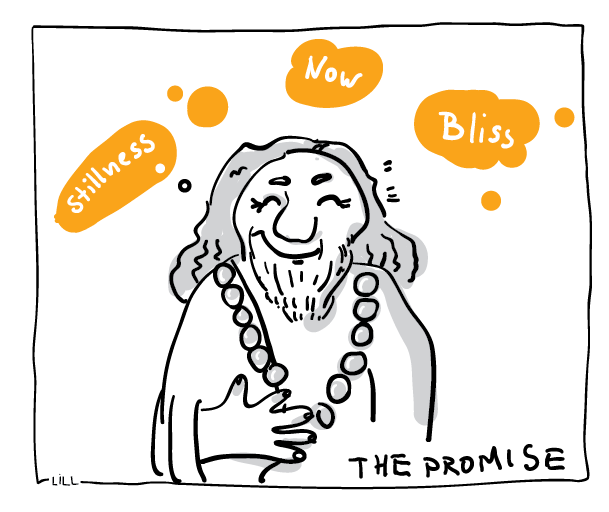 Putting all of that aside, I realized that there's a really very good purpose for the "guru look". Sure, it's part of a sort of uniform, but it's also a signal. They provide visual and auditory cues which tell me to SLOW DOWN. That's all there is to it. They cues are employed to assist in carefully listening to the questions, and the pauses are there to allow me to consider and inquire. In other words, STOP. We've come to the part where I let you know the outcome of this inquiry. 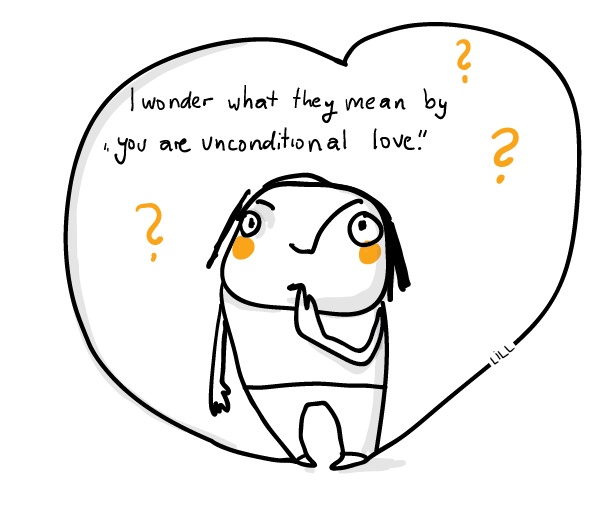 "Unconditional love" is a phrase I've read in nearly every spiritual book . It's an appealing enough set of words that flows very nicely and makes a fine new age mantra. If you're into that sort of thing. Me? I find New and Age to be at odds with itself. But I've got to start this inquiry somewhere, so why not approach it from a more practical perspective. Like a dictionary. 2. Mathematics, absolute (def 12). 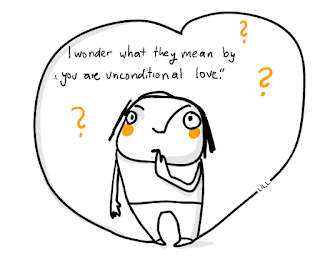 It seems, after pondering the above for quite a while, that "unconditional love" is a completely redundant phrase. Because "without conditions" would mean that anything and everything is accepted, as it is. Not a single condition can apply. Not even the Acceptance because that, itself, implies a condition of welcoming. In thinking this through, I've never experienced anything without conditions. Or, maybe it's more accurate to say that the "I" has never experienced without conditions because the job of the Me seems to be to judge and classify everything in its path. Relentlessly. So, what is the only thing that doesn't judge? Well... that would seem to be what I'd call LOVE. By my own definition, Love itself, then, is unconditional. The two words first define each other and then ultimately cancel themselves out. When looking at this closely, the canceling out leaves me still and silent. The only thing remaining is THAT which IS. And absolutely nothing more can possibly be said because to do so would be to spin back into conditions. It's suddenly grown really very quiet around here. Hi! Are you also traveling along the path to awakening? Welcome. We have a fun approach to Inquiry that's not always spiritual. But it is a lot of fun! There's no reason why our inquiry shouldn't be approached with a light heart and mind. So I've created a companion blog based on the clever nondual doodles of artist Ingrill Lill. Here you'll find notes on an ongoing investigation of reality undertaken in the voice of her delightfully curious fictional character, Ingen Findes. Ingen's inquiries are written by me, Delma McConnell. To read my other blog, a collection o of pointers to no separate self, go to Tabula Rasa. Newsflash: "Staying in the Now" Is a Crock! My name's Delma. I've also 'worked' under the name Thassa, one I swiped from a fictional character in the book titled, Generosity: An Enhancement, written by Richard Powers. I've appropriated that moniker as all things being equal, playing one character is as good as playing the next.